We left our house at 9am and got home around 3pm yesterday. Being there felt like riding a bike.....a bike that we never wanted to get on. Nonetheless we were back to what we are good at; managing Caleigh's care in a room full of strangers who make assumptions about her immediately. We had to wait around for quite awhile. Caleigh totally rocked her iPad and by the time we left everyone was talking about how smart, bossy and persistent she is. That makes my heart happy. We talked to the anesthesiologist about the length of time it took Caleigh to wake up last time she was under. She decided to cut back a bit on the silly juice dose and manage the anesthesia part minimally. When Caleigh finally went back she was relaxed, but still aware. She requested "cherry coke" as her face mask scent. I'm assuming she chose coke because she just read a school book about "Pop." I had to explain that there are many ways to say pop, soda pop and coke. Here in North Texas most of us call it coke even if it isn't a Coke. This must have stuck with her because she has never even seen a cherry coke around our house. I asked her later if she like the smell and she said "no." We were told that the total time would be about 30 minutes. It ended up taking well over an hour. When we went in to talk to the GI he explained that Caleigh's g-button stem was too short. It was causing erosion on the bottom side of the stoma. So basically it looked like granulation tissue on the inside. I'll save you the scope pictures this time. He said that it oozed and seeped when touched, so he took several biopsies. He seemed a little concerned, but mostly thought the ulcerated area was from her button. She wasn't even joking when she repeatedly told us "my button hurts" "my tummy hurts." He decided to cauterize the area, so there was quite a bit of bleeding during the procedure. After he finished that area he went down a little further into the small intestine. At that point there was a problem with anesthesia having the breathing tube to far in. It was essentially only inflating one lung. Eric and I are not happy about this part. Rookie mistake really, especially with all the monitors she was hooked up to. So our GI quickly grabbed some biopsies and got out without looking to much further. We do have images of her fundoplication. This was done along with her g-button surgery when she was six months old to prevent Caleigh's excessive green bile vomit from being aspirated. It is now non-existent. It looks like a loose piece of skin rather than a tightly woven piece. This is encouraging with all the swimming face dipping, cup drinking, and even everyday secretions that happen. This means that Caleigh's swallowing is working well. 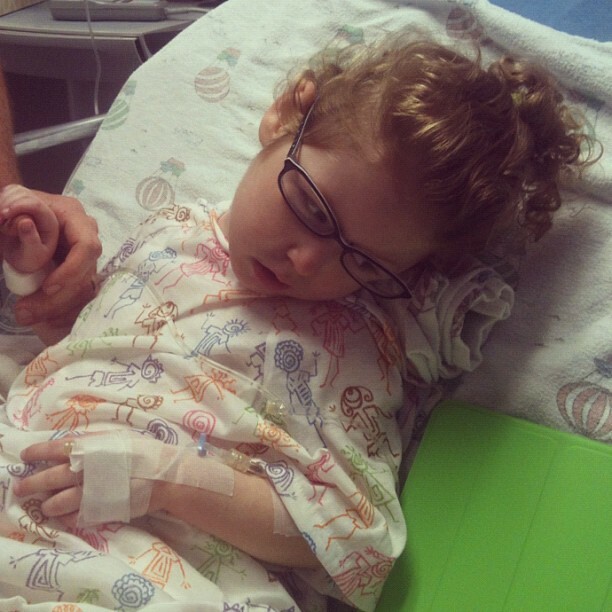 Caleigh woke up easily from the procedure and we were called back quickly when she did. She has a new g-button, a non-balloon version of her old one. The hospital didn't have her size with a longer stem in stock. We will have a balloon version at our house in the right size in case this new button mysteriously jumps out, although these are harder to remove. This was actually the very first type of button Caleigh ever had. It appears that they only had to stick her twice to get an IV; which is great for Caleigh. She was bit by two mosquitoes while in the hospital. In true Caleigh form she is huge and swollen in those areas. She has also developed a crazy skin rash in the exact shape of each monitor lead, tape placement and a bizarre gigantic rectangle on her back. I'm not even sure what that was used for. These are all perfect in shape which means the adhesive used for whatever is the problem. Caleigh still says "I feel hurt" when we ask her. I imagine it will take awhile to heal from the cauterizing and biopsies. She slept well last night except for the half a dozen times I shook her to make sure she was still breathing. Yes, I still do that. Biopsy results should be in sometime early next week. The enzymes tend to come back randomly so I'm not sure when those will come back. They also did regular labs while she was under and those came back great. Thank you to everyone for your well wishes, thoughts and prayers. They are all very much appreciated from our family.